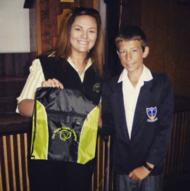 What better way to start the new term, than by celebrating last term's top recycling schools?! Kabega Primary climbed to the top of the green ladder with a total weight of 10354kg of recyclable material. 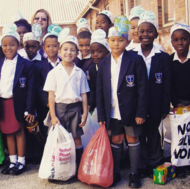 Kabega Primary's pupils are all involved in their recycling efforts, and the school celebrates their green spirit by taking part in a variety of environmentally educational activities. A colourful school in Zwide collected a total of 6029kg of recyclable material - BJ Mnyanda's principal, Mr Lukasi, questioned us with regards to who their competition was, we couldn't help but notice his competitive nature when handing over their prize for winning second place... (watch out, Kabega!) 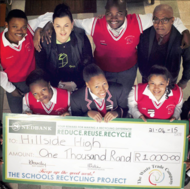 Hillside Highschool challenged the general misconception that recycling works better in primary schools. 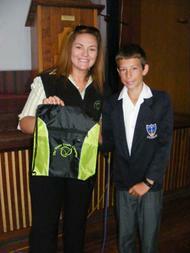 They won third place with a total of 5584kg collected for the first term. Furthermore, we would like to welcome a new addition to our 3R Family, Emmy Nxayeka. Emmy is excited to be the new Schools Project Coordinator and cannot wait to start visiting schools, "it is so exciting to be a green warrior, I am looking forward to spreading the 3R culture in schools! ".